My daughter thought this birdhouse's hairdo was pretty funny! I was happily surprised by yet another SNOW DAY! What is better than a Snow Day? A Snow Day on a Monday. I'm looking forward to playing games, updating some TPT items, and perhaps venturing out to do some shopping at my favorite store...Barnes and Noble! Last Friday my class and I finished up a project to share with other classes around the country. SPOILER ALERT!! If you are participating with the Winter Wonderland Exchange Project at First Grade Carousel, you may not want to read on! These are the projects my class decided would be fun to send to my friend Maria who organized this fun exchange. We put A LOT of glue in a zip-lock bag and then added wiggle eyes, a carrot nose and three buttons. 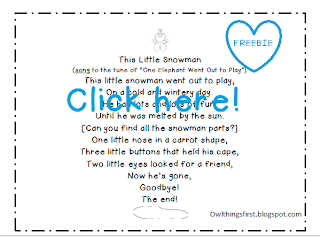 We sealed it and attached a song to sing as students look for and arrange the snowman parts to look like a snowman! Only one bag broke on us and I hope that the ones we sent all arrive in good condition to Maria! Thank you Maria for organizing such a fun project...I can't wait to see what everyone else did. What ever the weather where you are...I wouldn't trade! 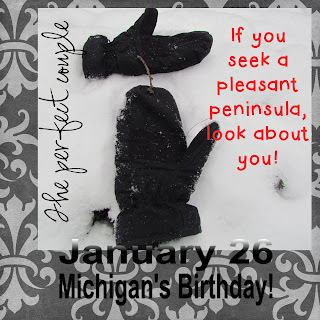 I love my Michigan! The snowmen are so cute! It boggles my mind how it can be 80 degrees here (not to rub it in or anything :) and snowing up north at the same time. Enjoy your Monday snow day-we don't get them down here in Texas! Those snowman baggies are so cute! No snow day here (Houston)...it's over 70 outside! We were too far south to bask in the glory of a snow day. :( We only got the rain. I L-O-V-E the snowman, he's super cute! I just love your SNOWMAN in a BAG project! My first graders will love it! Thanks so much for the song too! That is VERY cute, Jenny!